I began fooling around with radios when I was 10 years old or so. First, I built one of those shortwave radio kits from Radio Shack, which was back when they still sold radios. Then I bought a small tube type AM transmitter at a garage sale. The woman there said her son built it several years ago from a kit and it had the instruction manual. I don’t even know who made the kit. After some experimentation and changing out some tubes, I got the thing to transmit on about 1600 kHz, although it was a little hard to nail down as it drifted quite a bit until everything heated up. I don’t know what power that thing put out, but it was certainly less than a watt. All of this lead to a brief stint in the military as a radioman. That was an interesting field, albeit different from what I thought it would be when I signed up. It was during this time that I did some part time work at an AM/FM/TV station assisting the Chief Engineer. Once it was established that I actually knew something, my responsibilities grew until I was assigned the AM/FM part of the deal. After a year of that, I moved to a different city for family reasons and took the Chief Engineer job at a local AM/FM station. The AM station was a 50,000 watt directional in the high end of the band which had a Harris MW-50B transmitter. My previous station had a Bauer 10,000 D AM transmitter. What could be so different? Plenty I learned, on my second day. We were subjected to a wicked lightning storm, which, Murphy being present, took out the main transmitter. The backup was a GE BTA25 which was running at half power because of the age of the 5891 final tubes. The symptoms of the MW-50 where as follows: It would run along fine then there would be a big blue flash and a cannon shot boom, followed by the step start relays cycling and it would come back on the air. There were no overload lights nor any other symptoms leading up to the overload or subsequent to it. I began by killing the power and shorting out all the high voltage parts with a shorting stick. I noticed that things inside this transmitter where a little unusual, so I got the manual out and started reading. The most unusual aspect of this transmitter is the 25 KV isolated box that the PA stage occupies. 25,000 volts DC is a great big potential and what I found over the years is that this transmitter needs to be kept very clean. Of course, this unit had not been, and that was a part of the problem. The other unique aspect of this transmitter is the damper diode, which is required by PDM transmitters to conduct voltage during the negative modulation peaks. If the damper diode breaks down for any reason, the PA supply voltage tries to go to infinity, which is a good deal larger than 25KV and all sorts of problems begin. To make a long story somewhat shorter, this is the problem I had. The solid state damper diode had one bad section, which was causing all sorts of corona problems during heavy negative modulation peaks. It took a call the Harris factory to determine this. The entire diode assembly needed to be replaced because every section is matched. That cost a couple of thousand dollars as I recall. While I was working on the MW-50B transmitter, I was not impressed. It seemed a little cheap and flimsy. Later, when I voiced my concerns with the station management, the Harris transmitter salesman stopped by and said I needed to get with the program if I wanted to work in that market. This was a Harris town you see, if you start bad mouthing our products, you’ll be the one to suffer. Well, he retired, I kept looking around for other AM transmitters. Three years later I went to work for the competitor across town. Today that station has a Nautel ND-50. The MW50 went off the air once every 6 months for the entire time I worked at this station. It was always something different, power supply rectifier, bad PDM board, bad directional coupler, arcing insulator on the isolated box, etc. I began to feel it didn’t like me, and I know I didn’t like it. In fact, you could say I have never really liked Harris transmitter products ever since. The 50 KW air cooled power supply was the light weight version. 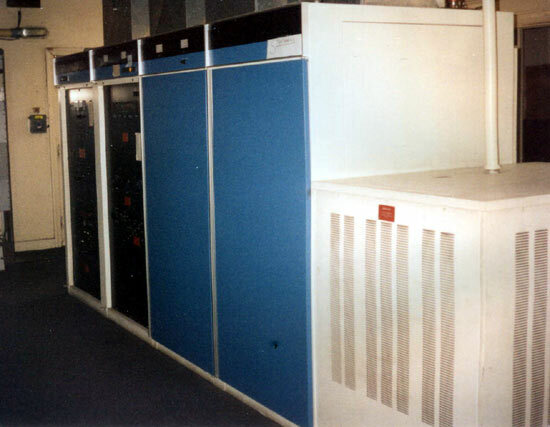 Most MW-50 transmitters had 100 KW oil cooled supplies. The problem with the 50 KW power supply was it was designed with a zero safety factor. All of the rectifier were running at or near maximum current and voltage. It only took one of 144 diodes to go bad, either short or open, and the whole transmitter would crash. Again, no overload lights or other indications of problems. We later installed air flushing fans in the power supply cabinet to keep things cool and that helped out quite a bit. The other thing was a DC feedback sample to the PDM card. It seems that if the filaments were turned off before the bleeder resistors took the 25 KV supply to zero, the remaining voltage would be routed to the PDM card via the DC feedback sample, blowing the foil off of the circuit card. We fixed this by installing a gas discharge tube with a series resistor at the connection point for the DC feedback sample. Then there are the infamous 1N914 diodes in the directional coupler that Dave points out below. I am sure I am forgetting something else, but you get the idea.